Be part of one of New York City's most-celebrated events with this 3-hour Macy's Thanksgiving Day Parade premium viewing experience. From a location between 57th and 58th streets, along the parade route, you can watch the floats, performers, and marching bands as they head toward Herald Square. Gourmet breakfast and brunch cocktails are served at the restaurant with 2nd-floor views so you can stay warm while you watch the parade, or go outside to the private viewing area. When booking, select the seating option you prefer, from general admission to premium window seats. 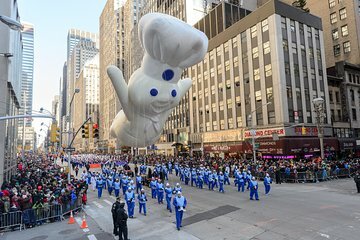 Your experience starts at Quality Italian, a multi-level restaurant on 57th Street where you'll have prime viewing access of one of New York City's biggest traditions — the Macy's Thanksgiving Day Parade, the symbolic start of the holiday season. From your exclusive vantage point along the parade route, feast on an unlimited gourmet breakfast buffet of Italian-style dishes, plus brunch cocktails, and watch the festivities of the parade with a live televised feed. If you prefer to be outside amid the crowds and excitement, just head to the street-level cafe, which offers coffee, tea, hot chocolate, and light snacks to keep your warm as you admire the bands, floats, and celebrity performers marching by along 6th Avenue. When booking, you have several seating options to choose from according to your preferences and budget. General admission does not include seating, but other categories provide premium views and window seats. We have done this two times. It is great to know where youll be watching the parade and to know you have someplace warm to escape the cold, get a bathroom, hot chocolate, etc. THe downside is that we paid for a private table with a view. Our view didnt exist. We were in the middle of the room with no way to watch the parade from the inside. This was fine since the weather was great, and being outside with the people was half the experience. If it had rained I would have been very upset with our situation. This happened to us both times, but we felt it was worth coming back anyway. Just dont expect a window view of the parade even if it is promised. The food was good and the mimosas were plentiful.